It is pretty simple really. We know our clients are artisans. They know that the recipe that has helped grow their brand only works if the ingredients are top notch. Consistency and quality are demanded by a growing, but still critical, audience of craft beer drinkers. The recipe for that famous brew can withstand no less than the highest quality ingredients. Our mission statement critically includes the term ‘our’. An extended family of like-minded individuals pursuing a collective passion. We want to not only be a part of this amazing community, but we want to help it thrive. Whatever we can do to make our farms accessible, educational, and ultimately approachable for both our brewers and their clients is a core value that we will encourage. It all starts on the farm. The gentle care of the plants, the careful harvest, the precise processing and the overriding concern for quality are all themes that align completely with the craft beer community. 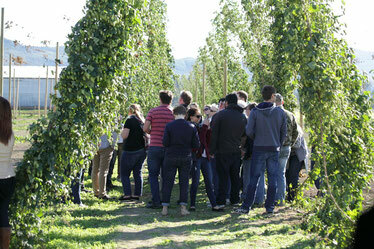 Inspired by the great traditions of hop production throughout the Fraser Valley, our partner farmers recognize the opportunity presented by the burgeoning BC hop industry. Fertile soil, sun, water and gentle breezes contribute to one of the world’s best hop growing environments here in the Pacific Northwest. We will passionately support the family farms upon whose production we depend. The BC Hop Company will be the most sought after organization to represent quality hops grown in beautiful British Columbia.